For some crazy reason, I thought that D’s stitches would be the “big event” this summer. I called that one wrong. Thursday afternoon I had just turned to my computer to download some pictures from my camera when I hear the paper shredder turn on and K start to scream. I’m pretty sure this was immediately mixed with my own screams. I got it turned off, but there was no way to get her hand out. I think I was in a state of shock, but managed to call my mother-in-law to see if she could come get the boys, and when I told her what happened, she called 911. I sat on the floor with K, both of us crying, while Z stood looking out of the window for the firetruck, also crying, and D ran back and forth between us trying to pat our backs and comfort us. Our wonderful next door neighbor came by and got the boys right when the firetrucks arrived. The firemen attempted to get the shredder off of her hand, but were obviously hurting her, so I kept yelling at them to stop. They seemed frustrated with me, and told me they would just have to transport us to the hospital. I said that would be just fine. In the ambulance, I held K with one arm, and the shredder with the other. We reached the hospital, and were taken immediately to a trauma room, where my husband met us. There were approximately 20 people in the room; doctors, nurses, a chaplain, child life specialists, etc. It was overwhelming, but I do remember feeling relieved that this team of people would figure out how to take care of my baby, and all I had to do at that point was hold her and comfort her, and let them do their jobs. I was also reassured when I heard one of the doctors say to another, “Well, last time what we did was…”. I was so glad they had had a last time, and I wasn’t the only one out there competing for the “worst mother” award. The doctors assessed the situation, and attempted several things to remove the shredder. These things didn’t work, so they had to call someone from the maintenance department to bring down a saw. They attempted a small saw, which didn’t work, and then told us all to shield our eyes while they tried a bigger saw. (At this point K had morphine and something to calm her down. She was still crying, but I don’t think she was in too much pain). Luckily they had a sheet up, so Kaitlyn and I could not see what was happening with the shredder, or what her fingers looked like when they came out. 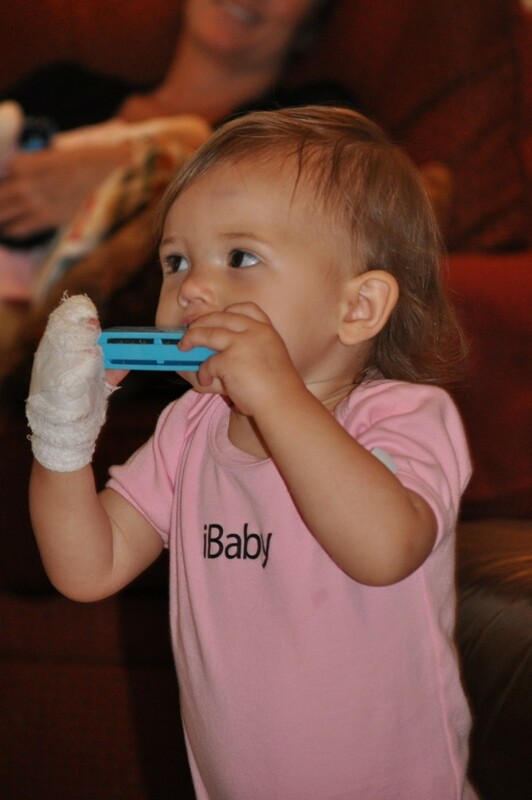 Her poor little fingers were smashed and badly cut. Initially it was hard to tell how badly they were injured, but over the next few hours, and x-rays, we found out that there were no broken bones, and most likely her fingers would heal okay. They kept us overnight to monitor blood flow in her fingers, and to give her antibiotics and pain medicine. She really did great, the entire time. Thank goodness for Elmo. We watched, “Adventures of Elmo in Grouchland “, four times straight that night. Now we are relieved to be home, and so grateful that her injuries were not worse. Of course, as a mother, there are really no words to express how terrible this was. 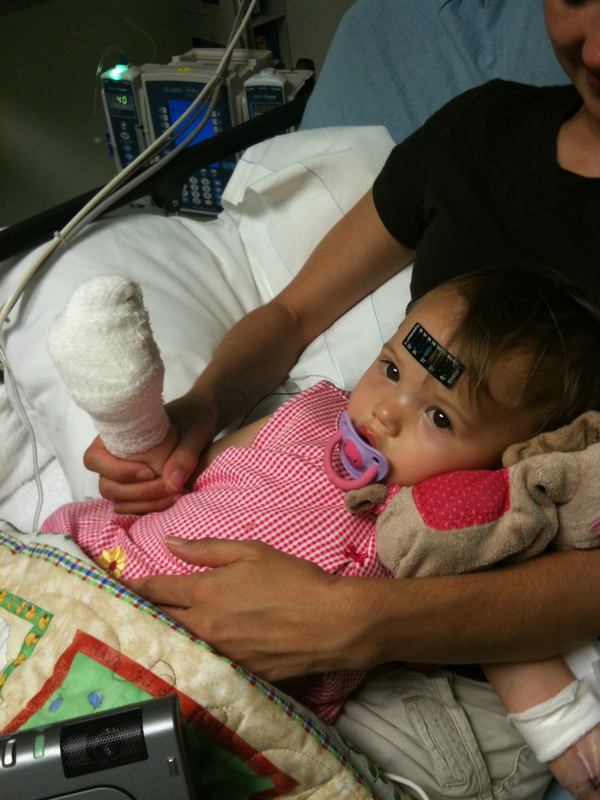 I was overcome with guilt that this happened to my baby, fear about the future of her poor little hand, and absolute anguish over my baby in pain. Today these feelings are all still fresh, but I am also so grateful that she is really and truly okay, and that she is navigating her world with one hand and a smile on her face. So happy to be home!! I punched the “Like” button -then realized there should be a “Hate” button as I hated the whole experience for all of you. I thank God that Kaitlyn is going to be all right! Thank goodness your precious girl will be okay…I have a feeling it is going to take you alot longer to “heal” than it will take that resilient little girl! Kristin’s paper shredder is right below her computer where Reese sometimes plays…I never thought anything of it! Take care. Oh, I’m so happy to hear she is doing great!!! Danny mentioned to me what happened and I was so relieved to read your blog today and know she is recovering just fine. I thank you so much for sharing the story. We have been praying for her. Oh, Emily, I’m so sorry! Poor you and poor little K. Thank you, Lord, that she is doing so well. I hope we can see you all soon.